Decision-making has great importance for success of organization in contemporary management system. Managers have to take critical decisions at every stage. Decision-making pervades through all managerial functions such as planning, organizing, staffing, directing and control. In planning for example manager decides what to produce, where and when and in organizing manager decides about distribution of work, delegating authority and fixing responsibility. Decision making is commitment to something and a principle or course of action. It is selecting the best among alternative courses of action. The decision-making consists of various factors. Decision-making means that there are various alternatives and the most suitable alternative is chosen to solve the problem. Another factor is existence of alternatives in which the decision-maker has liberty to choose an alternative of his fondness. Decision-making is goal oriented. It implies that the decision maker attempts to accomplish some results through taking vital decisions. Programmed and non-programmed decisions: Programmed decisions are those that are made in harmony to policy, procedure and rules. These decisions are regular and cyclical and programmed decision is comparatively easy to make. Non-programmed decisions are new and non-repetitive. If a problem has not arisen before or if there is no precise method for handling it, it must be tackled by non-programmed decision. For programmed decision, there are definite rules exists and therefore it is not possible for two persons to find different solutions to the some problem. In case of non-programmed decision, there are no set rules to deal with the problem. Each manager may bring his own personal beliefs, attitudes and judgments to bear on the decision. In this case, it is possible for two managers to find different solutions to the same problem. Top level manager must have this ability to make non programmed decisions. Major and minor decisions: Major decisions are taken cautiously and intentionally by the application of human judgment and experience where as minor decisions are made almost subconsciously using rules. The decisions that impact for long term on departments are categorized as major decision. Alternatively, corporate decisions that do not have long term effect are known as minor decisions. Some of major decision example in organization includes diversification of existing product lines, adopting new technology are the major decisions. The decision to obtain raw materials is a minor decision, Major decisions are made at top level and minor decisions are taken at lower level in the organizational ladder. Simple and complex decisions: Another category of decision making is to take simple and complex decision. Simple decision is taken in situation where there few variables considered for solving a problem. If the variables are many, then it is an intricate decision. Strategic and tactical or operational decisions: Strategic decision is making good choice of actions concerning allocation of resources and contribution to accomplish targeted goals of organization. Strategic decisions are major and non-programmed decisions and have long term impact. A strategic decision may involve major removal from earlier system. For example, modification in the product mix. Strategic decisions are taken by senior management. Tactical or operational decision is stemmed from strategic decision. It is associated with daily working of the organization and is made in the context of established policies and procedures such as taking decisions for provisions of air conditioning, parking facilities. Such types of decision are taken by the lower level managerial staff. Individual and group decisions: Decision may be taken either by an individual or group. Decisions which are routine in nature, with few variables and exact procedures exists to deal with them are taken by individuals. Decisions which have their impact on other departments, which may result into some transformation in the organization, are taken by groups. Deciding priorities among the problems. Developing alternative solutions or courses of activities. Converting the decision into effective action and follow up of action. Important steps of the decision making process. (1) Recognizing the problem: Decision has great impact on organization's operations. When a manager takes any decision, it is in effect the organization's response to a problem. Therefore, it is essential to search the environment for the existence of a problem. A problem exists when there is divergence from past experience or deviation from plan. Problem emerges when competitors do well or when people bring problems to the manager. It is the responsibility of manager to thoroughly explore the root causes of problems. (2) Deciding priorities among problems: After identifying problems, manager must assess which problem has more harmful impact on organization. He may find that some of the problems are such that they can be solved by their assistants because they are closest to them. All such problems should be transferred to subordinates. Some problems may need information available only at higher level or affecting other departments. Such problems are referred to higher level managers. And those problems which can be best solved by him are to be focused. (3) Diagnosing the problems: It is necessary to understand the intensity of problem. Symptoms of the problem that are observed by the manager may some times misinform him. The symptom may lead manager to think one part when the defect may lie hidden in another part. For example if there is decline in sales, the management may think that the problem is one of poor selling procedure or the saturation of the old market. But the real problem may be incapability to move quickly to meet varying needs of the clients. To diagnose the problem, a manager should follow the systems approach. He should study all the sub-parts of his organization which are connected with the sub-part in which the problem seems to be located. (4) Developing alternative solutions: A problem in organization has many solutions. However, all the ways cannot be uniformly satisfying. 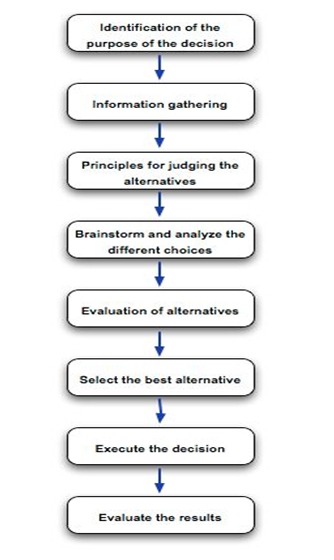 Decision maker must recognize various alternatives available in order to get best result of a decision. It can be said that all alternatives are not possible to consider either because information about all alternatives may not be available or some of the alternatives cannot be considered because of limitations. Therefore while choosing alternatives, it is necessary to consider the concept of limiting factor. Limiting factor is one which stands in the way of accomplishing a desired objective. A decision maker can categorize alternatives using his own experience, practices followed by others and using creative practice. From past experience, decision maker takes into account the action. The successful action of the past may become an alternative for the future. But main restriction of such thought is that success in past experience may not necessary in the present context because of changing business situation. Other method of developing alternatives is through creative process where various exercises are taken to create completely new ideas. Creative ideas of individuals or groups help in developing alternatives. One popular group technique is brain storming. The brain storming group consists of 5 to 10 people. The best idea behind brain storming is to think of as many alternatives as possible without pausing to evaluate them. (5) Measuring and comparing consequences of the alternative solution: After developing various alternatives, it is essential to measure and compare their outcomes of alternatives using quality and acceptability. The quality of a decision must be determined considering both tangible and intangible consequences. Tangible consequences are those which can be quantitatively measured or mathematically demonstrated. Intangible consequences cannot be measured quantitatively. A decision though good in quality may be poor in acceptability or decision though acceptable may not be good in quality. In such cases managers must find the relative importance of these two. (6) Converting the decision into effective action and follow up of action: in this step, decision must be communicated to the employees in clear and unmistakable terms. All necessary efforts should be made to secure employees involvement in some stages of decision making. Association of employees in decision making not only improve the acceptability, but also improves the quality of decision. Environment of decision-making: In organization, decision making process has immense importance and sometimes managerial team may not be competent to select best alterative. This problem may be highly complex and vague. These conditions of knowledge are referred to as the 'environment of decision making'. The environment of decision making is categorized into three types that are certainty risks and uncertainty. The environment of decision-making is a range, at one end there is complete certainty and at the other end there is complete ambiguity. Decision-making under certainty: The term certainty denotes to precise knowledge of the outcome of each alternative. All pertinent data are available for making decision. Decision-making under risk: In decision making under risk, the outcome of a particular decision cannot be specific with certainty but can be specified with known probability values. The value of probability is a measure of probability of the happening of that event. In such cases, alternatives are evaluated by computing the expected value of the payoff associated with each alternative. Decision making under uncertainty: Uncertainty exists when the decision maker does not have good knowledge of the probabilities related with the possible outcomes, though he has been able to recognize the possible outcomes and their related pay-offs. Since the probabilities are not identified, the decision maker cannot use the principle of maximizing the pay off. To summarize, decision making is a selection of the best among alternative courses of action. Effective and successful decisions can be beneficial for company and prevent losses. Therefore, corporate decision making process is the most critical process in any organization. In the decision making process, managers choose one course of action from a few possible alternatives. In the process of decision making, we may use many tools, techniques and perceptions. Decisions may be grouped as programmed and non-programmed decisions, major and minor decisions, simple and complex decisions, strategic and operational decisions. The environment of decision is classified into three types that include certainty, risk and uncertainty.